High Performance Optics for Diode Pumped, Solid State (DPSS) LasersREO Inc.
Building efficient, high performance, diode pumped, solid state (DPSS) lasers requires a careful balance between price, performance, and stability of the cavity optics. In particular, there are a number of optical components that critically affect laser operating and output characteristics, and whose specifications must therefore be properly understood and managed. In addition, unit-to-unit and batch-to-batch performance consistency of components is desirable for OEMs, since it reduces the need for adjustments during assembly, broadens the process window and yields greater design headroom. REO manufactures a variety of cavity optics for DPSS lasers, and has developed a broad fabrication toolset for delivering components which supply the optimum mix of quality, performance and price for a specific application. This section reviews the types of products available from REO for DPSS lasers operating at their fundamental wavelength, and in which damage due to high peak powers is not a significant concern. It presents the typical specifications and tolerances that REO can deliver, and explains some of the technology employed to fabricate high performance components at competitive prices. This information is intended to help specifiers and buyers of coated optics for DPSS lasers understand how to obtain the performance they require in the most cost effective manner. Each of these components is a possible source of loss. But which are most critical, and how does the designer determine the necessary specifications for each? These questions become increasingly important as laser builders attempt to maximize the efficiency (that is, the conversion of input electrical energy into laser output) of their designs, in order to build systems that offer lower power consumption, less waste heat, and longer lifetime, yet without dramatically increasing costs. It is important to realize that the process technology used to produce the optics can have a dramatic impact on the loss performance. The major mechanisms of loss in optics – including scatter, absorption, unwanted reflectance of some components, and unwanted transmittance of others – are determined by design, but are also critically dependent on the manufacturing processes used to make them. Polishing processes, thin film coating technologies, cleaning processes, and inspection techniques all play a role. The table shows typical estimated loss values for each resonator component for two different performance grades. “Standard Performance” refers to optics widely available through many catalog sources, and “High Performance” refers to optics manufactured using technologies and practices specifically developed for laser applications. where L is the sum of all resonator losses except for the transmission of the output coupler (e.g. scatter, absorption and transmission or reflection losses) and g0 is the unsaturated gain of the laser medium. To understand this relationship more generally, the graph shows power extraction efficiency as a function of cavity losses for a range of plausible laser parameters, including a range of typical losses for a set of standard performance optics (L ~ 7500 ppm) and a set of high performance optics (L ~ 750 ppm), and for several representative laser gains. Two main points can be made with reference to this figure: first, a high power extraction efficiency can be achieved by a high performance optics set with much less gain than with a standard optics set (~10 times less gain for ηE = 0.9). Second, for a fixed gain, efficiency, and therefore output power, increases with decreasing loss. For the lowest gain shown, ηE = 0.9 efficiency can only be achieved with the high performance optics set. 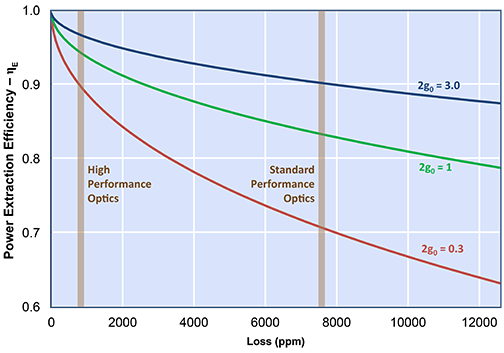 Higher operating efficiency can always be achieved by improving the loss characteristics of the optics. Another important element to laser efficiency is the pumpthrough efficiency, which is equal to the pump-wavelength transmittance of the pumpthrough mirrors. The quantity Pmax from above is directly proportional to the pumpthrough efficiency and therefore to the transmission of the pumpthrough optic. In order to avoid this factor as a limitation to overall laser operating efficiency, it must be maintained at a level well above the desired efficiency specification (e.g., a 90% transmission level translates directly into a 10% efficiency loss).